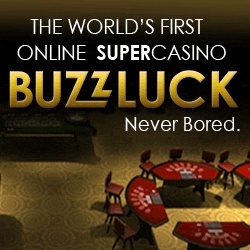 There is no surprise why so many gamblers like baccarat card game much: it is very easy but exciting to play and you should not be a genius or very good mathematician in order to remember all baccarat rules and start playing this popular casino game. 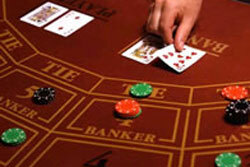 The maximum points a player can get in baccarat is NINE, and the goal of every player is to guess what card hand will have this number or the points closer to nine than other hands. Players do not gamble against each other, they play with a dealer but it will be not a person but option that will be a winner: the duty of a player is to predict which option it will be. There are only 3 possible options a player can bet on: Player, Banker, Tie. 14 players maximum can take part in a game but only one of them will play with a dealer: other ones will just make their bets on this or that option. Two initial cards are dealt both to a player and a dealer and the sum of the points these hands have determines the winning option - it can be Player or Banker (Tie is also possible but it happens very seldom). All points will be counted and summed up in a way the final result will not exceed 9 points. The worst result will be 0 of course (it is surprisingly, but baccarat is named after its worst result: "baccarat" means "zero" in Italian). If your final result is 8 or 9 points - do not take the third card; if the result is 5 or less points - you are welcome to take one more card from a shoe. Number of points Player's third card What should a banker do? Player is paid as 1:1. Banker is paid as 1:1 too but it will take 5% of your winning as a commission. Tie is paid as 8:1 (14,4% will be taken from you in a case of winning).